Almost forty years ago, there was no such borough as ‘Tameside’. Tameside Metropolitan Borough is a product of the 1972 Local Government Act. The borough, as per the Redcliffe-Maud report was originally going to be known as ‘Ashton-Hyde’. This name would have peed off Mossley and Dukinfield residents for example. Forty years on, the borough’s nine towns retain a clear identity of their own, though its institutions use ‘Tameside’ as a catch all term to serve all areas in the borough. Few people say they are from ‘Tameside’ as there is no such place (it relates to the area on the banks of the River Tame). Residents are likely to say they hail from Ashton, Stalybridge, Dukinfield and Denton. Or from Millbrook, Hattersley, Haughton Green or Broadbottom. I always say I’m from Dukinfield, but often say it’s near Manchester or Cheshire. Some people would ask me ‘where’s Tameside’ is if I said ‘Tameside’. And I know, having lived in this borough all my life. Here ends the waffling, any references to the borough may refer to the towns before 1974 as well as after ’74. You remember seeing the White Horse over Heyrod from a Mossley bound 343 service: seen above the railway line to Huddersfield was a white horse created by Bill Rawsthorne in 1981. The retired railway worker who lost one arm in an accident in the 1940s created the 106 feet horse in heather, and it was visible from Millbrook, Carrbrook and Bottom Mossley. He died from a stroke in 1992, which saw his creation neglected. You sometimes referred to Dukinfield as ‘Hicksville’: on the side of Shepley Road bridge, where Dukinfield meets Audenshaw, there was a graffito which read ‘Hicksville’. It was seen by motorists and passengers aboard the 220 service till the mid-1990s. The mere mention of ‘Wally Walrus’ means ‘jump in the water’: from the late 1980s, Tameside Leisure Services’ mascot for young children’s swimming lessons was a cartoon walrus. Though the walrus was never seen enjoying a Bovril on the balcony of the William Andrew Swimming Baths in costume, it was used ‘Simon Says’ fashion to teach young children to swim in the borough’s pools. ‘Tommy Tameside’ means a psychedelic former Wigan Corporation double decker bus: from the 1980s to the noughties, Tameside used to have a couple of playbuses. They were often seen on fun days, with Tommy boasting a slide from the rear of the top deck. Tommy was also joined by another front engined double decker named ‘Tilly Tameside’. Pod doesn’t mean a portable music player, but a youth club: during the mid-1990s, a number of areas within the borough had portable buildings, which would be used as youth clubs. For example, one would be seen at the Blocksages playing fields car park. You pronounce ‘Hospital’ as ‘Hospidal’: that is more to do with the accents around our borough. Similarly, ‘buses’ is also pronounced as ‘buzzes’ by Ashtonians, as is consistent with people from other Lancastrian towns and cities in the Greater Manchester area. You’ve had a joke published in the Ashton Reporter: in other words, in the children’s section which is the fiefdom of Uncle Ben, and has been since the start of the 20th century. Uncle Ben, hopefully DBS checked these days still has a page in the Glossop Chronicle and the Tameside Reporter. ‘Over the hill’ refers to Hyde instead of an aged person: an often tongue in cheek/derogatory term. It is often used by supporters of Stalybridge Celtic to describe their rivals, Hyde FC, who play at Ewen Fields. You still refer to All Saints Catholic College as ‘St. Peter’s and St. Paul’s’: a few older people still refer to All Saints in this way, though it changed its original name in 1980 when Tameside MBC adopted comprehensive educational systems. You knew the difference between ‘Big Boardy’ and ‘Little Boardy’: one for the older Dukinfield residents! ‘Big Boardy’ referred to the long demolished Crescent Road Secondary Modern School, whereas ‘Little Boardy’ referred to at one time the older building of Lyndhurst Primary School. A new building and playground is on the site of the latter establishment, whereas some of Roland Bardsley’s houses is on the site of Big Boardy. 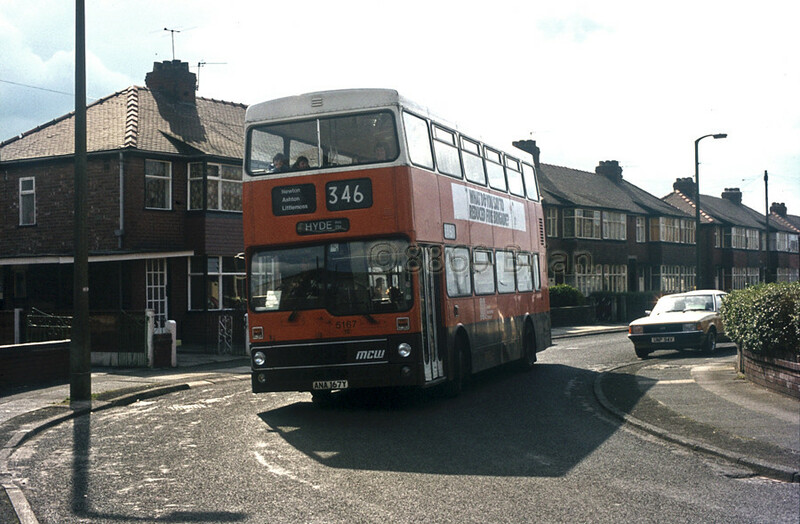 The 409 is ‘The 9 Bus’: equally true for a possible ‘…Too Long in Oldham/Rochdale If…’ entry, but the popular bus service was known as the ‘9 bus prior to SELNEC’s renumbering in 1973 – 74 as a service within the 400 series. It was jointly operated by Ashton-under-Lyne, Oldham and Rochdale Corporations till the 01 November 1969. You direct motorists via the BT Roundabout and ASDA Roundabout: everybody in Tameside must be familiar with the two roundabouts which link up to Park Parade owing to the amount of traffic, or many an unhappy hour spent queueing outside Scotland Street DHSS office in the 1980s. Christmas feels out of place without the ‘Bridge/Hyde Derby Fixture: from a personal point of view, Christmas isn’t Christmas without a trip to Ewen Fields on Boxing Day, with the return leg at Bower Fold on New Year’s Day. I consider it as one of the highlights of the sporting calendar up with the City/United Derby, the Grand National and The F.A. Challenge Cup Final. Christmas without ‘Bridge/Hyde, just isn’t Christmas. You abbreviate Dukinfield to its first four letters: as ‘Duki’. Need I say more. See also Crescent Road as ‘Crezzie Road’. Stuff the extreme-right grammar advocates or the pedants – it’s either Dukinfield or Duki – and ending with an ‘i’ not an ‘e’ for the latter. You’re spoilt for choice for pies: forget Greggs and the other chain store bakeries, the best pastry products come from our local ones. For example, the borough’s finest pork pies hail from Bradley’s Bakery, Hurst; Stalybridge Celtic’s and Ashton United’s Meat and Potato Pies come from the excellent Carr’s The Bakers on Springs Lane and Mossley Road (a 387 or 389 service between the two shops). Oh, and don’t get us started on the superlative offerings of Bowker’s on Penny Meadow or The Chicken Barbecue’s offerings on Market Avenue. No night out is complete without Lee Ashley or Carlo Sax: both are fantastic singers and, if on at a Tameside pub near you, always well worth supporting. (Check the Cheers Magazine or public house blackboards for further details). ‘Love Shack’ reminds you of nights out in 1990s Ashton: the song by The B52s from 1990 would inspire the name of a night club. It is a popular request among listeners of The Tameside Jukebox programme on Tameside Radio, each Saturday and Sunday morning (10am to 1pm). Stamford Park meant the little train and the Smurf dodgems: oh, for the mid-1980s Stamford Park when 1986 saw the arrival of a little road train around the park. It was quite an enjoyable way of venturing around the park, and linked up with the aviaries, paddling pool (with decrepit bus shelter type cover opposite) and the crazy golf course. Then there was the joys of the Smurf dodgems, a coin-operated ride next to the boathouse close to The Stamford Belle’s pay booth. Plus there was a rather good café opposite, alas gone. I could have gone up to forty, but I thought I would leave it at eighteen, a nice number to finish on for a light hearted article. If you have any anecdotes of the above, or wish to add some more yourself, feel free to do so. And I’ll race you to the ice cream van on Darnton Road, to the strains of Nik Kershaw, Falco or Wham!, if I could find a white, orange and brown coloured time machine on Stand C of Ashton bus station. With a SaverSeven of course! Exotic buses – green SHMD buses. Good shout! Not only the exotic green and cream buses, but also the red and cream liveries of Manchester Corporation and the North Western Road Car Company. How can we also forget Ashton-under-Lyne Corporation’s blue and cream livery – or the earlier one with dark blue, white and a red stripe (seen below the lower deck windows). Towards the late 1980s and early 1990s, some may be happy to add the two tone blue of Citibus, the yellow and red of The Bee Line Buzz Company, Pennine Blue’s Ashton Corporation inspired livery or the two tone green of Glossopdale Bus Company. I was in high school 1983 to 1988. Glad you liked the piece, when you started at Littlemoss, that would be back when the 346 had an extension to Droylsden. Before bus deregulation, it was every 20 minutes from Ashton to Hyde and (I think) the Droylsden extension was hourly. An excellent article, but one minor correction – the DHSS (later DSS) Office was at Crown Buildings on Booth Street, Ashton – the building on Scotland Street was the Unemployment Benefit Office (Dole Office) of the Department of Employment where you went to “sign on”. It also housed the County Court in the 1980s and 1990s. During the 1990s the Unemployment Benefit Offices were merged back with the Job Centres (they had been separated in the 1970s) under the name “Job Centre Plus”. Ashton’s old Job Centre was on the corner of Warrington Street and Old Street, I think it’s now Santander, the new office was purpose built lower down Old Street. Many thanks for the clarification. Scotland Street housed the County Court till the early noughties. I do remember there being three entrances for the DoE offices – A, B, C – and the rather grim ambience. Not least the queues which, in the early 1980s, would stretch from the subway entrance. I think it was around 1974 – 75 when Ashton Job Centre moved to Warrington Street/Old Street. Then they moved to new premises (with the changes you described) in 1996. Firstly as the Jobcentre. The ‘Plus’ was added in 2001, which saw the closure of some standard Jobcentres (Denton’s on Hyde Road was one example). After the Jobcentre moved, Bradford and Bingley took over the unit prior to its absorption by Santander. Which is close to its predecessor’s (Abbey National) branch. For a short while, they had a second branch in Ladysmith Shopping Centre (formerly the National and Provincial Building Society). Stunning, I feel the need to include this in my next book. Currently trying to explain the ‘Duki was an outgrowth of Stalybridge,’ thing. Not to mention the outrage of being moved to live in Cheshire. Given that I now know be over th’ills i.e Hudds, I still BELIEVE that The Spread Eagle is On The Roundabout. And I direct people in traffic accordingly so. It really naffs them off.